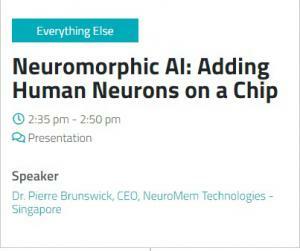 DUBAI, UNITED ARAB EMIRATES, April 16, 2019 /EINPresswire.com/ -- NeuroMem Technologies Pte Ltd, a neuromorphic hardware technology company using pattern recognition, has confirmed that its CEO, Prof Pierre Brunswick, will present the company’s disruptive neuromorphic artificial intelligence (AI) technology alongside an elite line-up of speakers at AI Everything from 30 April to 1 May in Dubai. Prof. Brunswick will present “Neuromorphic AI: Adding Human Neurons On A Chip” at 2.35pm on 30 April. Brunswick's session will share information on NeuroMem’s neuromorphic technology, showcasing its pattern learning and recognition technology that provides reactive anomaly detection, on-the-go learning, at high-speed and at low-power AI options. In addition, he will showcase the wider applications that have been developed around the world with this technology and its collaborative program with institutions around the globe to promote the use of its technology. Pierre Brunswick’s presentation: 30 April, 2.35 pm under “AI Everything” presenting Neuromorphic AI: Adding Human Neurons On A Chip.